A rock bed at the Gillespie Lake outcrop on Mars displays potential signs of ancient microbial sedimentary structures, according to a study by geobiologist Nora Noffke in the journal Astrobiology. 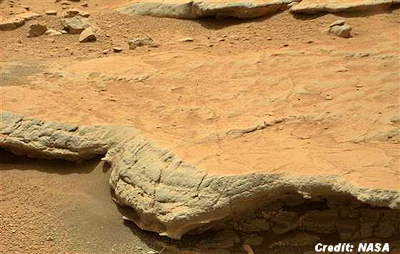 The study, however, does not prove that ancient life existed on Mars. The photos were taken as the Mars rover Curiosity drove through the Gillespie Lake outcrop in Yellowknife Bay, a dry lakebed that underwent seasonal flooding billions of years ago. Mars and Earth shared a similar early history. The Red Planet was a much warmer and wetter world back then. On Earth, carpet-like colonies of microbes trap and rearrange sediments in shallow bodies of water such as lakes and coastal areas, forming distinctive features that fossilize over time. These structures, known as microbially-induced sedimentary structures (or MISS), are found in shallow water settings all over the world and in ancient rocks spanning Earth's history. . . .